Consider getting your child their own seat. I know, the prospect of saving hundreds of dollars is tempting, but if your child is on the taller or larger end for their age, 7 hours in a cramped space will be painful for both of you. 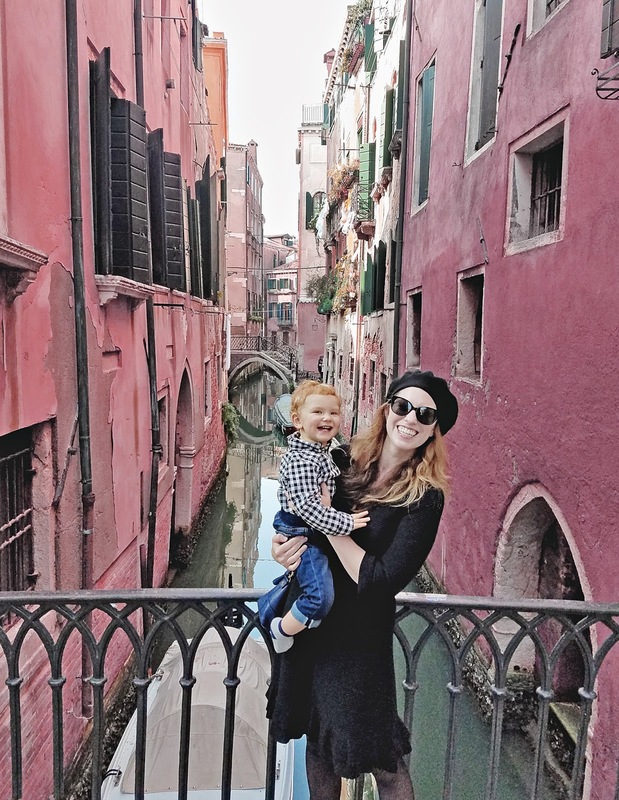 James was 16 months old when we brought him to Italy for the first time and even though he was only in the 50th percentile for weight, he was in the 90th for height. That's a lot of baby to try and keep contained to your lap for an entire afternoon. At the very least, I strongly urge you to fly Comfort Plus. You'll appreciate the extra leg room as that extra weight presses into your lap, cutting off circulation. Some European countries are much more lax when it comes to child car safety. My husband was convinced that because we were paying 90€ to rent a car seat, it would be the top of the line. It was not. There was no chest clip, minimal padding, no way to adjust the angle and the car seat did not clip into anchor points. We ended up placing the car seat in the center of the back seat, rear facing, using the seat belt, which had no slack. I was a nervous wreck the whole trip and James was too, as he never slept more than 30 minutes in the seat. Either confirm ahead of time with your car rental company as to the type of car seat they will have available, or book your child their own seat on the flight and bring your car seat from home. I caution you against checking your car seat, as luggage tends to be thrown around and if your car seat takes a direct impact, it's basically useless. Most European hotels are small and independent. Many of them make little to no profit (especially in Italy) if you book through a third party site, so you can usually get a better rate if you go through the hotel directly. Also, If you are using a third party, like Expedia to book, I implore you to follow up with the hotel directly to confirm any special sleeping arrangements at least 24 hours in advance. My husband booked all hotels that supposedly had cribs and include a "note" in our bookings through Expedia. Not a single hotel got this "note." Since most European hotels are boutique hotels, none of them had cribs on site and all of them needed at least a day to contact their housekeeping services and have a crib delivered. Let me tell you, trying to get a rambunctious, sleep deprived toddler try co-sleeping for the first time while you are both jet-lagged is not pleasant. Most of Europe is not handicap friendly and consequently is not stroller friendly. Don't worry about it. These buildings are centuries old and people have been living in them with children, handicaps, and disabilities for hundreds of years. I warn you now, the odds of you finding a bathroom that is accessible by stroller are pretty slim. As long as you can say the world "toilet," maybe repeat it in the language of the country your visiting, and point to your stroller, someone is going to know what you mean and will assist you in getting to the nearest bathroom, even if it means helping you carry a stroller up a flight stairs. Added bonus: they will often point out an area you can use as a changing station, since most rest rooms in public places do not have them. PRO TIP: Many European women will sit on the toilet and change their child on their lap. These women are obviously heros, and should be treated accordingly. Most Europeans use some form of public transportation on a daily basis. Buses and trains generally have a designated area for strollers. In addition to having special seating for handicapped individuals (usually near the entrance/exit), these seats are also available to women with children. Designated areas are enforced and if you get on and find that they are occupied, the driver or attendant will assist you in getting you a seat and space for your stroller. We visited Venice on the weekend and used public transportation (the "Water Bus" - the "water taxi" is private and considerably more expensive). At one point, we were closely packed into the Water Bus and quite far from the exit when I needed to get off quickly. I signaled to the attendant that I needed help (through wild gesticulation, since my Italian is more or less limited to reading menus) and he cleared a path for me, Tony, a stroller bound James, and 2 rolling suitcases. Likewise, each attendant assisted me in lifting James on and off the Water Bus while he was still in his stroller with no prompting - you do not need to ask, it will be done automatically, whether it's a Water Bus or regular city bus. I'll go into more detail on my favorite strollers for traveling Europe, but as long as you have a sturdy stroller that folds up enough to fit into the trunk of a sedan, you should be fine. A $50 umbrella stroller is not going to cut it on ancient cobblestone streets. You need moderately sized wheels to tackle the roads and sidewalks, but don't go too large, because there is no way a BOB is going to fit into a European car trunk, elevator, or be easy to carry up a flight of stairs. We usually bring our Citi Mini GT. The wheels can handle the streets with no problems, although it is a little cumbersome in elevators and slightly larger than most European styles. That being said, they also provide more storage and a greater recline for a napping child, which is great if you're going to be out for an entire day of sight seeing. An ideal stroller that's easily accessible to Americans would be a MacLaren. Baby carrying past an early age is not common, so expect some looks. Staring is totally common in Europe and not really taboo. Even in Venice, which is about a million bridges, people still use strollers. After one day of carrying James up and down approximately 40 bridges, Tony was over it. Personally, I was not bothered by it and literally every single family, of which there were many, was doing the same thing. However, we did bring the Ergo and if Tony was willing to wear it, who was I to argue? As I said, it's not common for toddlers over the age of one, but if it works for you, that's all that matters! Areas that would typically be off limits, like a private restaurant or cafe where you are not a patron, will let you use their restroom if you ask...or point to your baby and say "toilet." Truly, no one is going to say no or give you a weird look, it's not a big deal. Just be prepared for it to be relatively small and not have a changing table, so it may require some creative problem solving. This tip may be a little particular to Italy, where there are many, many large Catholic churches that see quite a few visitors and pilgrims. Most large cities will have a sizable cathedral or basilica with public bathrooms, ramps for wheelchairs (and strollers), courtyards where you can rest, picnic, feed your child, etc. James and I spent several hours in the Basilica of Saint Anthony of Padua. I walked around the courtyards while he napped, used the handicapped accessible bathroom, which had a changing table, had a snack, and then we explored the actual basilica, where there were many other people with small children and strollers. Just remember to dress appropriately if you want to go inside the actual basilica.